We’re talking about the Midwest’s largest social media conference with founder Jessika Phillips. Welcome to Episode 002 of the Livestream Deals podcast, I’m Ross Brand. June 20th and 21st is Social Media Week Lima, Ohio. This year’s theme is the Human Experience, taking emerging technologies and pairing them with relationship marketing. I’m honored to be speaking on the Live Video Panel along with Mia Voss, Brian Fanzo and Kate Volman. ... See More Other speakers include the husband and wife tandem of Brian Kramer and Courtney Smith Kramer, Cathy Hackl, Carlos Gil, Mike Allton, Demian Ross, Tiffany Lanier, Mike Gingrich and many more. Since I spoke with Jessika, they’ve added a topic on running a Facebook group around a passion to create a profit. Also, Social Media Week Lima is kicking off the10-day, 3-conference #RoadtoSocial trip with social media influencers traveling from Lima, Ohio to Wichita, Kansas and then Denver, Colorado for Social Media Day Denver at the end of the month. I get the feeling there might just be a few livestreams along the way! You can save $50 on the ticket price at http://SocialLima.com/. Use the code NOW50. This is not a sponsored or affiliate link. I’m super excited for the conference as Jessika and her team do a first-class job in creating an awesome experience for attendees. Livestream Deals has been a monthly Facebook Live show hosted by Ross Brand of Livestream Universe. Each of those episodes features 4 products or services for live streamers… as well as products of interest to podcasters and online content creators. On the podcast edition, we will focus on one product per episode. Some content will come from our livestream shows and some will be exclusive to the podcast. 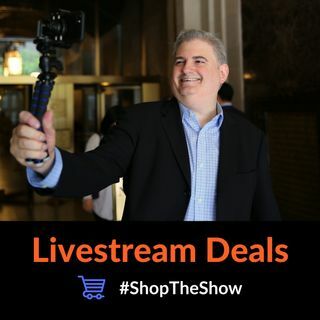 You can learn more about products featured on the show at https://LivestreamDeals.com. Some of the links on the LivestreamDeals website are affiliate links. You never pay extra for buying through our site, but we may earn a small commission from your purchase that helps us continue to showcase high-quality gear, content and events on our livestreams and podcasts. I only feature those products that I have tested personally or are highly-recommended by multiple trusted members of the LivestreamDeals community.